Jaimee's Hotel & Resort strives to make your stay as comfortable and enjoyable as possible. Please click on the headings below for answers to your frequently asked questions and hotel policies. Check-in is after 1:00pm, and check-out is 12:00pm. Yes, we charge 150 Pesos per hour for early or late check-in (up to 5 hours), then a full days accommodation rate applies. We accept all major credit cards, however, a 5% surcharge will be added. Is breakfast included in your room rates? Yes, breakfast is included in the room rate for two persons eating between 7:00 am until 10:00 am. Breakfast requests after 10:00 am will be charged at 150 Pesos per person. Breakfast is served between 7:00 am until 10:00 am in the coffee shop or in the guest’s room. Yes, all rooms in Jaimee's Hotel are air-conditioned. Is hotel car pick up and drop off available? Bato -1,300 Pesos one way, Hilongos - 1,500 Pesos one way, Baybay - 3,000 Pesos one way, Ormoc - 3,500 Pesos one way, Tacloban - 4,000 Pesos one way. Wifi is available for free for hotel guests in the Coffee Shop. Our 5th floor Internet Cafe is also available for guest's use, please ask in the Coffee Shop for details. Charges for the Internet Cafe are 25 pesos per hour. Can outside visitors use the hotel's facilities? No smoking is allowed inside rooms, however, there are designated smoking areas outside the Hotel. The exception to this is terraced rooms where smoking is allowed on the terrace only. Can I bring outside food and drinks into the hotel? Guests may bring food and drink from outside to their rooms, however, “all food and drink consumed in the Hotel grounds including, pool areas, coffee shop, bar’s and restaurant shall be purchased from the Hotel”. Can guests stay overnight in my room? Outside visitors are not allowed to stay overnight in a guest’s room without registration and charge. Visitors intending to stay overnight (past 12:00 am) should register in the coffee shop. A charge of 700 Pesos per person will be added to the room charges for additional persons. Additional single beds requested for a room shall be charged at 700 Pesos, inclusive of bed, pillow and blanket. Additional items shall be charged as follows: Pillow 50 Pesos, Blanket 100 Pesos, Towels 100 Pesos. 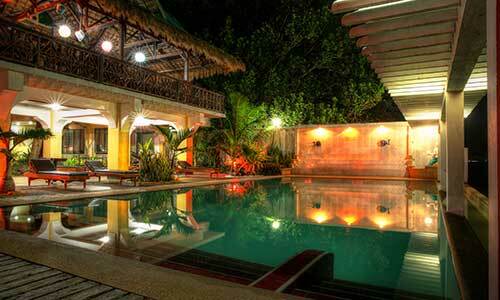 Jaimee's Hotel & Resort is conveniently located just 10 minutes drive from the Southern Leyte capital Maasin City. For a map showing our location and approximate travel times please click here.